Ouagadougou – If things had gone differently, Baby Siaka* might have been born in Spain or France. Or Mali. Or Algeria. Or even at sea. All could have been plausible birthplaces for the first child of a young Liberian couple who left home in December 2017 to attempt a dangerous African crossing and a dreamed-of arrival in Europe. 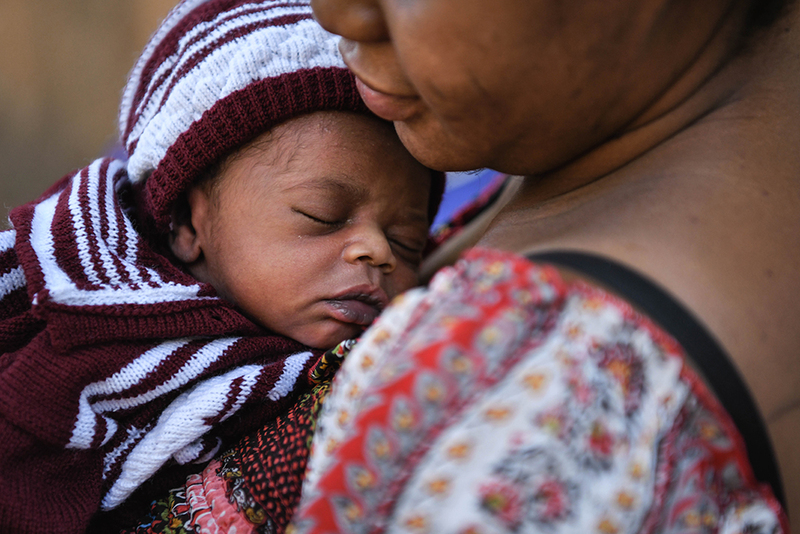 Instead, Baby Siaka first saw light on earth in mid-January in a transit centre operated by the International Organization for Migration (IOM) in Ouagadougou, Burkina Faso’s capital city. “This is my first child. I am so relieved everything went fine during the delivery,” says Aminata*, holding her baby son. She never thought she would feel such happiness again after her long and traumatic journey across West Africa. Burkina Faso is a key transit country in West and Central Africa. Over the past two years, IOM noted nearly one in five of all flows observed in the region as IOM Flow Monitoring Points was in Burkina Faso. Moreover, IOM staff identified 29 nationalities among some 4,500 migrants interviewed as they crossed the country during 2018. Ivorians (32%), Nigerians (24%) and Malians (16%) made up almost two-thirds of the sojourners. Aminata left Liberia together with her husband in December 2017. Their dream was to reach Algeria and work there. Friends told them that if they wanted to and if they got lucky, they might even reach Europe. But once in Mali, things did not go as planned. The smugglers who had promised them a safe journey vanished. Aminata and her husband were stranded in a foreign country, not knowing anyone and not speaking the language. They hit the road back to Liberia via Burkina Faso. “I was sick, penniless and desperately looking to go back home. An IOM staff I met at the bus station in Ouagadougou told me to seek assistance from IOM. A few days later, I discovered I was pregnant,” the new mother recalls. “When she arrived in Ouagadougou, Aminata was sick and it was impossible for her to travel,” explains the IOM doctor who assisted her at a local health facility in Burkina Faso’s capital city. The IOM protection team is now assisting Aminata with the baby’s civil registration and birth certificate. When fully fit to travel, the IOM mission in Liberia will take over the assistance by offering her tailored reintegration assistance. In 2018, IOM Burkina Faso provided shelter to 205 stranded migrants mainly originating from Liberia, Guinea and Mali. These migrants were referred to IOM via the Flow Monitoring Points, governmental institutions like ‘action sociale’, the police, other UN agencies, NGOs or embassies. In 2018, 138 migrants decided to opt for voluntary return with reintegration assistance back in their country of origin. Four of the 205 migrants were referred to the UN refugee agency (UNHCR) for complementary protection measures. The assistance to stranded migrants is funded by the EU-IOM Joint Initiative for Migrant Protection and Reintegration, funded by the EU Emergency Trust Fund for Africa and implemented by IOM, and the government of Burkina Faso. “Now, I want to travel safely back to Liberia and leave this difficult story behind me. I want to be reunited with my family and build my future there,” Aminata adds. For more information, please contact Andreas de Boer at IOM Burkina Faso, Email: adeboer@iom.int.